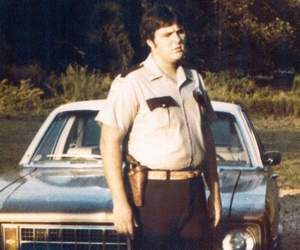 Deputy Sheriff Charles Jordan was shot and killed after responding to a burglar alarm at a pharmacy on Route 70, Pegram. Although he was off-duty he lived nearby and was called to check the scene. When he arrived on the scene he informed dispatchers that he observed two suspects inside and that he had taken up a defensive position behind his patrol car to wait for backup officers. A third suspect, who was acting as a lookout, approached him from behind and shot him in the back with a shotgun as he waited for the backup officers. The three suspects, who were brothers, fled the scene but were all apprehended and convicted of felony murder. In 2000 a portion of Highway 70 in Cheatham County was renamed The Frank Jordan Memorial Highway in his memory. Deputy Jordan was a U.S. Air Force veteran and had served with the Cheatham County Sheriff's Department for 10 months. He was survived by his mother, Reba, his sister, Pamela. and his brother, Johnny. We were both working evening shift that night and we both checked off at 12 AM. I went in to bed, Frank got called back out later in the morning hours to answer the call at the pharmacy. I woke up and turned on the news and saw what happened and headed in to work. Frank was a brother in blue and one of the most polite and well mannered Officers I have came across in my 38 year career. A time in my life I’ll never lose memory of. Looking forward to seeing you again one day Officer Frank Jordon.